While TrafficNeXt 3 has been ready for quite some time, the manual writing part was taking forever and was just now finished. It should appear in the products menu soon. As always, this is free software, allowed to be redistributed under the terms at the top of the program and bottom of the manual. In order to make our website easier to navigate, much of the content that was formerly in posts has been moved to pages. To find information on a particular product, simply hover over the "Products" button in the menu bar and select the product you would like more information about. The first version of our new traffic light control program TrafficNeXt was released today. This is the same program mentioned in the previous post, with a few minor bug fixes, as well as support for retriggering added (the light will cycle as long as there's a car near the sensor). 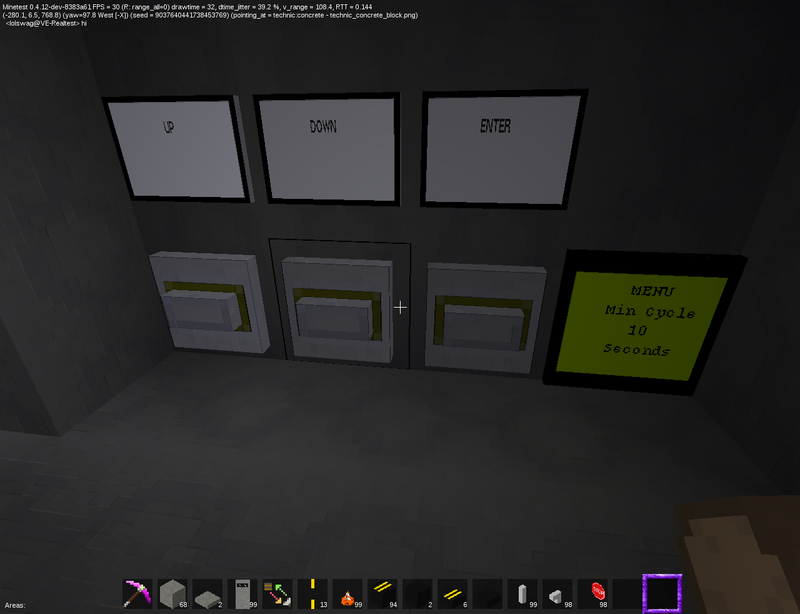 On initial startup, it will enter the menu mode, and the lights will flash. Use the up and down buttons to scroll through the available parameters. If you wish to change a parameter, press enter, and brackets will appear around the number to indicate that it is being edited. Use the up and down buttons to set the new value, then enter to save it. When done, select "Exit Menu" and press enter. Once the setup is complete, it will enter run mode. In this mode, the LCD shows several pieces of information. The first line will show whether it is waiting for a timer to finish ("Timing...") or waiting for a car ("Waiting..."). The second line shows the status of the main street lights ("M:") and the side street lights ("S:"), both either red ("R") or green ("G"). If a timer is running, the third line will show how long it is waiting for. The fourth and fifth lines show what controls are available at the time. When the controller is waiting for a car, the up button will initiate a cycle (simulate a car). Pressing this button at any other time may result in a malfunction. At any time, the down button will enter the menu. Pressing this while a timer is running may result in strange behavior from the lights, and is not recommended, but will not cause any damage. Min Cycle (0-99 seconds, default 15): After a cycle, how long until one can be triggered again. Side Green (0-99 seconds, default 10): The length of time from when the side lights are sent a green signal until the red signal is sent. The actual time the lights are green may be different, due to the yellow and red/yellow states. All Red (0-99 seconds, default 5): The length of time from when one set of lights is sent a red signal until the other set is sent a green signal. The actual time the lights are red may be different, due to the yellow and red/yellow states. TrafficNeXt is a new traffic light control system, designed to replace TrafficNet. It is not yet finished, but still in development. 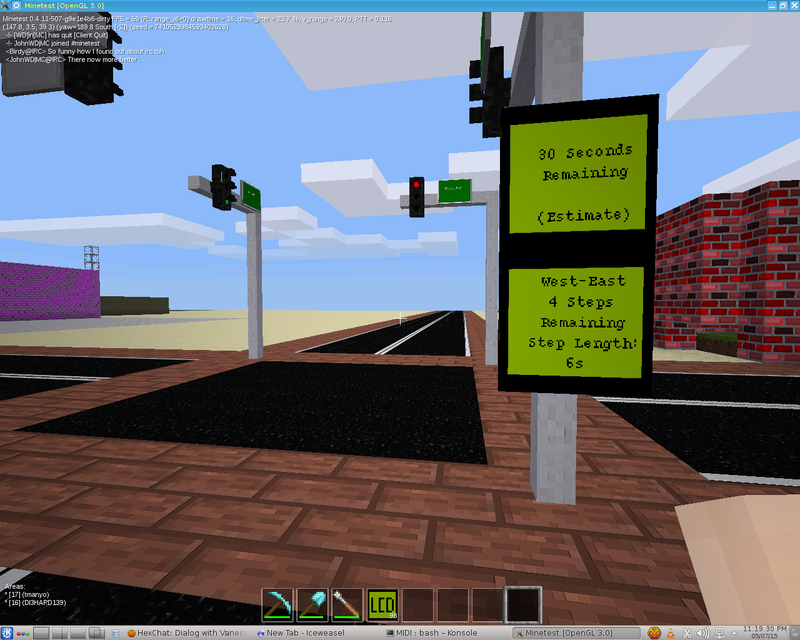 It is already in use at the intersection of North Street and Lua Street on VanessaE's creative server, and will soon be used elsewhere as well. TrafficTimer 4 has been released! Internal Oscillator - No more blinky plants! Contact cheapie if you would like a copy.